We’re sure Fern was simply trying to highlight the terrible scourge that depression can be when she talked about the issue. However, by labeling suicide as a ‘brave’ action she has simply re-enforced the pressure upon men – who commit 76% of all suicides in the UK– to continue to bottle it up. 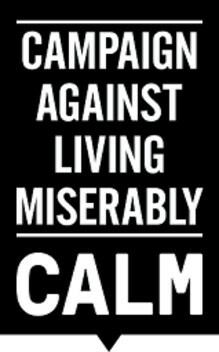 Young male suicide is not high on the list of government priorities, which means CALM is often not at the front of the line when funding is being handed out. This means we rely heavily on the support of volunteers and fund raisers to keep us going.